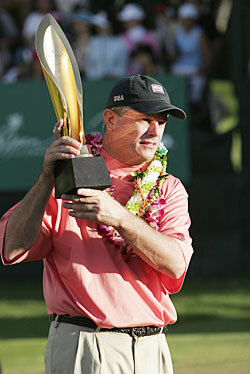 Defending champion Paul Goydos is out to prove that his 2007 Sony Open win was no fluke. The first full-field event on the PGA Tour offers local golf fans a chance to see many past winners of the Sony Open in Hawaii. Ranging from Ryder Cup team captain Paul Azinger through Vijay Singh, many of those who have tamed the narrow fairways of the Waialae Country Club will try to do so again as 144 golfers descend on the island chain. Despite losing to Daniel Chopra in a four-hole playoff at last week's winners-only Mercedez-Benz Championship, Steve Stricker moved past Jim Furyk into third place in the world golf rankings. The PGA Tour's Comeback Player of the Year in 2007 is just one of four golfers in the top 10 of the world rankings with a rating of 6.90. The other three here are No. 4 Jim Furyk, No. 9 K.J. Choi and No. 10 Singh, who beat Ernie Els in dramatic fashion to capture the Sony Open in 2006. Four more in the second 10 in the rankings will also join this solid field. They are No. 11 Rory Sabbatini, U.S. Open champion Angel Cabrera at No. 14, Masters champion Zach Johnson at No. 15 and No. 17 Aaron Baddeley, who lost to Els here in 2003. Defending champion Paul Goydos, who shared the stage with Tadd Fujikawa in 2007, is back as well and looking forward to playing a course more suited to his game than the one at last week's Mercedes. Last year, he birdied three of the final four holes to hold off Charles Howell III -- who is also in the field this week -- and Luke Donald to win only the second tour event in his long career. "I'm looking forward to playing Waialae again and get some of those good memories back," Goydos said. "I haven't defended very often, so it's a good feeling for me." Fujikawa heads a list of several talented local players that includes tour members Dean Wilson and Parker McLachlin. Both haven't had the kind of success they were seeking last season, but a good showing here would be an excellent way to start the season. 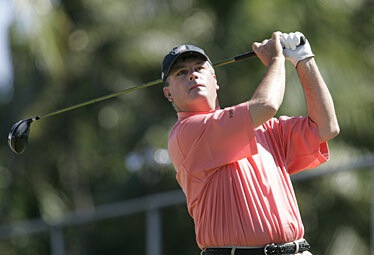 Paul Goydos didn't get off to a great start in 2008, shooting an opening-round 81 in the Mercedes-Benz Championship at Kapalua. After Sunday's final round at the Mercedes-Benz Championship, dressed to the nines, walking quickly, purposely to the scorer's tent, as if a security guard were about to tap him on the shoulder and say, "Sir, can I see your badge, please?" Paul Goydos has just improved eight shots on his disastrous opening round. Shooting a final-round 73 when others in this field are firing 9-under 64s is a bit disconcerting for this 40-something journeyman from Long Beach, Calif. His feelings are sitting comfortably on his sleeves. What's the PGA Tour like for a guy like Goydos? If you asked the man that question, you get an answer so highbrow, so stream-of-consciousness that by the time he rattled it off, you'd be somewhere else, far, far away from the Sony Open in Hawaii. He often talks to his caddie, answering a question through him. They're like some comedy act -- as if to say to each other, can you believe this guy? My life is spent answering some idiotic question from a reporter who covers the PGA Tour once a year? Difference between the Plantation Course and Waialae Country Club? What, are you kidding me? We might as well be talking about the Sun and Pluto. He again says it to his caddie as much as anyone. He's on a rift. He's just finished 72 grueling holes, carting himself up and down those hills -- which were not alive with the sound of music by the way, not on that dreary Thursday where the weather was better suited to dashing to your car with a wet newspaper over your head. He opens '08 with an 81. How long did you say until the senior tour again? Really, that long. He holed up in his room after Thursday's round thinking a thousand miles a minute. Comes back two days later in the relative sunshine and shoots a 6-under 67. Fourteen shots better in 48 hours. Nobody can explain it. This is the game we play. The only man out here who has any idea what's going on is Tiger Woods. He wins 60 times. We've won twice. So Goydos has a different perspective to what it's like being the defending champion than the world's best player. He likes the idea of hoisting the trophy, brought home shoulder high. Wished it had happened a few more times in a career that began with a win on the Nationwide Tour -- when it was called something else -- at the 1992 Yuma Open. Earning the coveted tour card in 1993, the substitute teacher became a college professor of professional golf. It's not that easy, let me tell you. He pocketed $87,804 his entire rookie season. Made almost that much finishing next-to-last at the elite winners-only event last week. Woods, Mickelson, Harrington, Scott not here. Don't get it. 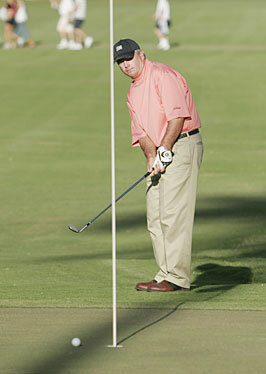 Paul Goydos watched his putt miss going in the cup on the 18th hole during the final round of the 2007 Sony Open. Not until 1996 did Goydos get his first win at the Bay Hill Invitational. His only win for nearly 11 long years. At his current rate, he'll be a senior citizen before he wins again. That kind of thing weighs on you, humbles you, makes you realize that what Woods does is beyond comprehension. It's like a reporter being asked to beat Hemingway in an essay contest on bull fighting. Not gonna happen too often. So you see what he's working with here, the kind of grind at play. To retain his playing privileges in 2006 -- sounds so much more elegant than keeping your card or holding on to your life's work -- he has to finish second at the Tampa Bay Championship to move from No. 160 on the money list to No. 97. To most folks, they have no idea what that means. But if you tell them you earned almost $900,000, they say, "So, what's the problem?" The problem is standing in the winners circle. Even after managing to do that last year, reality set in hard. The tour media guide puts it this way: Made his first start in a World Golf Championships event at the Accenture Match Play Championship. Lost in the first round to Jose Maria Olazabal in 19 holes. ... Ended season with a T30 at the Deutsche Bank Championship. Not much else to talk about. He's Harry Chapin's Mr. Tanner. Even in victory, the spotlight wasn't on him. Not that it was a bad thing. Not at all. Not even close. Watching young Tadd Fujikawa sink that eagle to make the cut on Friday sent chills down the spine of everyone who's ever swung a club. He has nothing but fond memories of sharing the stage with Fujikawa, a 16-year-old, so much unlike most of the kids he taught when he was Mr. Goydos, I will be your substitute teacher today. Tadd was something special. Anything else? Good, see you in Honolulu.